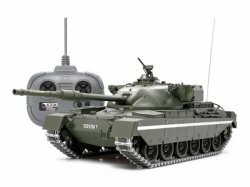 This is the electric powered, radio controlled, 1/25 scale Chieftain British Army Battle Tank Kit from Tamiya. Radio: Tamiya 4-channel Actcom with four buttons on .. Simply enter your details below and we will send you an e-mail when “56603 1/25 RCT British Chieftain w/4ch Tx” is back in stock!